A young orphan lives with a blacksmith and does a good deed for an escaped prisoner and later is invited to befriend a reclusive spinster and her ward who he falls in love with, but she despises him. Later he has a mysterious benefactor who sets him up as a wealthy man in London. 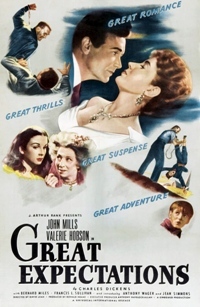 This is a good adaptation of the Charles Dickens novel with good performances from John Mills as the lead role as Pip and good support from ValerieHobson as the love interest Estella, an early performance from Jean Simmons as the young Estella and Martita Hunt as the disillusioned old woman. The script manages to translate the book well into a film and keeps the strengths and sense of the characters.